Tanzania is a country where our trip around the world will come to en end. It is a country located on the eastern coast of Central Africa. 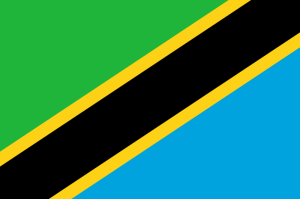 It is good to know that Tanzania was originally established by merging two states Tanganyika and Zanzibar. An interesting fact is that this country was one of a few former German colonies. And we should not forget the fact that there are two capital cities, the city of Dar es Salaam and Dodoma. The citizens of Tanzania consist from several tribes like in many other African states. In this case there are Swahili, Sukum and Nyamwezi. Thanks to colonial influences the official language is English and Swahili, like in the State of Kenya, our previous destination. Our round the world trip will slowly but surely end up in this destination so we want to experience the last few days in beautiful surroundings. At first we will go on a safari in the local Tarangire National Park, which is currently the sixth largest national park in Tanzania. In the park we are looking forward to seeing elephants and lions. A major attraction is to visit Africa’s highest mountain, Kilimanjaro. This mountain attracted us primarily because of the presence of gorillas living in the wild there. Many people who have experienced an encounter with gorillas say that looking into a gorilla’s face is a life changing. However, this experience is something we still need to think over. Getting close to the gorillas is quite expensive adventure, due to the conditions and costs of the trip. We would like to keep this open and according to the budget, we will decide on site whether go or not. But a safari is not the only attraction in Tanzania. The reason why we have chosen this country as the final destination of our trip around the world is simple. We want to visit a place that looks like paradise. This surely be provided when we visit Tanzania’s most famous island, Zanzibar. Zanzibar is a true pearl of Africa. There are beautiful white sandy beaches surrounded by the emerald sea. The shore is crossed by fishing boats and according to the information we have, there is peace and quiet at non-touristy places. This is the right environment to spend our last week of big travelling. 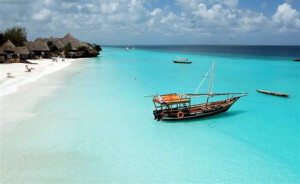 Within our vacation in Zanzibar we plan to go diving and enjoy the local mood and customs. Our vacation in Tanzania cannot finish without tasting the local specialties. Many people assume that because there is plenty of seafood the Tanzanian cuisine must be healthy, but this not entirely true. According to known information, for breakfast you may get a meat broth with Indian pancakes called chapati or Andaz, which should be something like Czech donuts. Another specialty are meat pasties. Lunch is often served with potatoes, fries or rice with meat. Very popular is the porridge made from maize flour, called Ugali, which is then dipped in various sauces. It is said that a great delicacy is Nyama Choma, which is specially prepared meat on the grill. From their seafood, we would like to taste the octopus with chili sauce. Africa is the continent where it all started and where it all ends. Here man has lived since the beginning of time and it is from here he has travelled all around the world. Africa is a continent that always makes people think about the beauty of this world and for us it is an inspiration to explore other parts of the world. Therefore this destination is symbolic and a very important oneon our itinerary. Our trip around the world will remain forever in our memories, whether on arrival to Prague or anywhere else.